Hunger affects one in eight Americans, including more than 12 million children, according to Feeding America. In fact there are more than 40 million Americans struggling with hunger and living with food insecurity, meaning they do not always know where they will find their next meal. 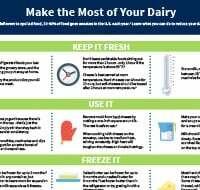 The Dietary Guidelines for Americans recommend 3 servings of dairy every day — that’s about one gallon of milk per person per week. Families who rely on food banks are missing out on milk in a big way. Milk is one of the most requested and nutrient-rich food items in food banks, yet there’s a shortage because milk is rarely donated. Food bank clients receive the equivalent of less than one gallon of milk per person per year, leaving many families without access to milk’s essential nutrients, including 8 grams of high-quality protein per serving and three of the top nutrients most likely to be missing in the American diet — calcium, vitamin D and potassium. Milk companies and dairy farm families have partnered with Feeding America to introduce the Great American Milk Drive — an easy way for you to take action and donate much-needed milk to hungry families in your community. The Great American Milk Drive makes it easy for you to donate milk to those who need it most for as little as $5.00. Simply go online at www.milklife.com/give or text “Milk” to 27722. AND, by entering your zip code, you can ensure that the milk is delivered to a local Feeding America food bank in your community! What is the Great American Milk Drive? Why Participate in the Great American Milk Drive?